Founded in 1922 by Samuel Mosher in Long Beach, California. Had stations in seven western states. Sponsored the Whistler radio series on CBS 1942-55. 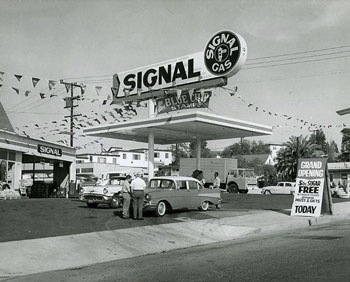 Sold its retail gasoline sales in 1967 to Enco (same company as Esso). As the Signal Companies the business fizzled out before the end of the century.